Mother's Day is just around the corner. How did that happen? I thought I would pass along some great poems that I have found over the years to use for Mother's Day. Many are hand print or footprint poems. I'm sure with all the creative wonders out there, they could be used for different types of activities. Most of my activities were laminated so they had a shine when I tried to scan them. The first poem is the same one we used for our Christmas gifts, we just personalized it for Mother's Day. You'll see I'm growing fast. You can't bring back what's past. To make you smile someday. 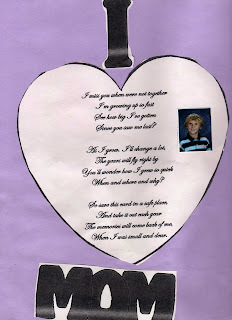 This poem I received from my little, one was inside a heart with lots of fingerprints everywhere and his picture. Card to mark my call. That told you I was small. Ive made this heart just for you on Mother's Day! Since you saw me last? when and where and why? When I was small and dear. Another gift I have gotten was a large piece of construction paper with stamps and decorations all over it. In the middle of the paper was the word MOTHER written vertically. After each letter it looks like the teacher wrote a word that started with the letter. I'm assuming they were words given by the children. Here is how mine read: Mommy knows best! ; Oh, so friendly! ; Terrific! : Helps me! : Excellent! : Responsible! Then it is written LOVE -----. I'm not sure if the children picked these words or the teacher. Another one I remember, which I really liked, but can't find was a large flower. 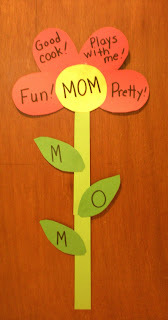 The stem had three leaves that spelled MOM. Then the petals had something special written about mom--again I'm not sure if these were teacher originated or child, but I remember it was beautiful. I think the center of the flower said MOM too. I made one real quick so you could get an idea. I can't believe I can't find the original! You also have to check out this beautiful Footprint Mother's Day Card over at Her Cup Overfloweth, it has a beautiful sentiment in it. What wonderful poems and ideas. Thanks for sharing! I am having a couple of giveaways on my blog - stop on by! ones that always make me cry! wow! thanks for mentioning my blog and the card I made!